1.5 How to Apply Online for KKR SSC Group B & C Recruitment 2017? Multiple Vacancy in SSC Karnataka Kerala Region: The SSC KKR Recruitment 2017 Notification issued recently for 42 Scientific Assistant, Data Entry Operator, Jr Conservative Assistant, other posts. 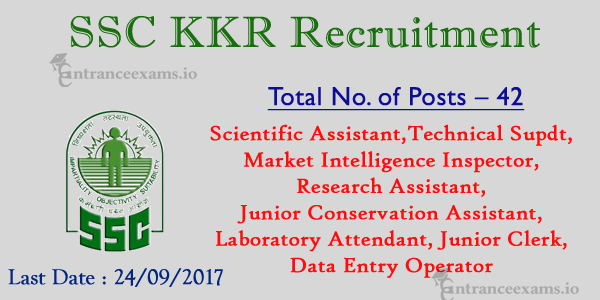 Apply Online for 42 SSCKKR Group B & C Jobs 2017 before 24th September 2017. Read the KKR Staff Selection Commission Notification 2017 @ ssckkr.kar.nic.in for eligibility criteria. Check the below sections for Selection Procedure, Pay Scale, and other details of SSC Karnataka Kerala Region Recruitment. Latest Job Alert for the Job Hunters!!! Are you waiting for the high pay Govt Jobs? If Yes, here is the good news. The Staff Selection Commission Published the Notification in Employment News for filling 42 Vacancies in Karnataka Kerala Region. This is the golden chance for the people who want to work with Staff Selection Commission. So, be the first person to utilize this chance by applying to SSCKKR Recruitment 2017. The aspirants who sent the online applications before 24th September 2017 are only considered. Before going to apply for the SSC KKR Group B & C Recruitment 2017, one should make sure their eligibility. For the postulant’s sake, we have gathered the Eligibility conditions from the official website and displaced on this page. Hence, aspirants can get all the essential details which are required to apply for the SSCKKR Assistant Vacancy 2017. So, take a glance at the below sections for further info about the KKR Staff Selection Commission Recruitment 2017. Aspirants have to make sure their eligibility before applying to the SSCKKR Group B & C Vacancy 2017. So, take a glance at the eligibility conditions provided below. Applying contenders must have an age between 18 to 30 years. But the maximum age varies according to the post. So, refer the official SSC KKR 42 Vacancies Notification for the post wise age limit. Candidates who done Bachelor’s Degree or Diploma in concerned discipline with two years of experience in the related field are eligible for SSCKKR Recruitment 2017. For the post wise qualification, go through the official Staff Selection Commission Notification 2017. Based on the performance in the following rounds, the commission will hire the postulants for the 42 SSC KKR Group B & C Jobs. The Basic salary payable by the staff selection commission differs according to the post. Check the official advertisement for the detailed pay scale. Aspirants have to pay the application fee either in online or offline. Therefore, deposit the application fee either with SBI Net Banking or through SBI Challan. For General and OBC candidates, the application fee is Rs. 100/-. To SC/ST/Female applicants, there is No fee. How to Apply Online for KKR SSC Group B & C Recruitment 2017? First of all, log on to the official website i.e., www.ssckkr.kar.nic.in. Or, click the apply link enclosed below. Search for the SSC Karnataka Kerala Region Notification 2017 and open it. Read it completely to ensure your eligibility. If you met eligibility, click on the 42 SSC KKR Group B & C Jobs Apply Online link. Register with your details and then fill the application form. Then, upload the recent photograph and signature. Make fee payment if necessary. Finally, send the application form hard copy with self attested copies to the below address. We advise the candidates to utilize the SSC KKR Recruitment 2017 before 24th September 2017. Share your queries if any through the comments. Also, Keep visiting our www.entranceexams.io site for the fresh updates from Staff Selection Commission.